I've been under the weather, so I'm glad I didn't commit to doing the 31 Day Nail Challenge this year...everyone has been so busy! I look forward to stalking the blogs each day and seeing what everyone has come up with. I'm entering a contest at Chalkboard Nails called "Cool Colors or Warm Colors". You pick a cool or warm color palatte and create a mani (on yourself) using only those colors. No decals, stamping or acrylic paint allowed. Pretty simple....something I can actually handle! I chose warm colors. Here's my entry. This mani was inspired by a Pottery Barn duvet cover. I started with a base of China Glaze Kalahari Kiss and taped off the first round of stripes, trying to make each nail different and interesting. 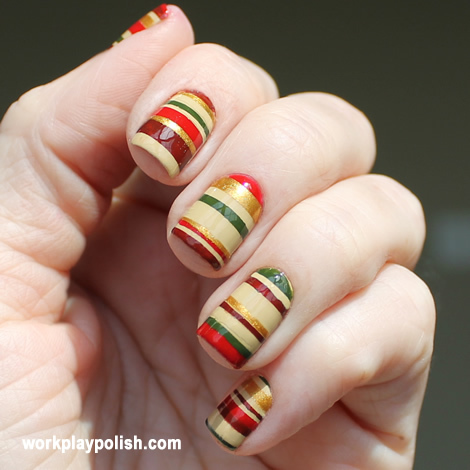 All of the stripes are Zoya polishes: Cola (brown), Kristi (red), Goldie (gold) and Shawn (green). After the first round of stripes dried, I taped off a second round. I finished with two coats of Seche Vite. I really like how this turned out. The winner of the contest, as decided by a panel, will get to pick three of The New Black Ombre polish sets.